As I was to engrossed in blogging last year and we think that we want to cement our already nearly full-on days of spending time together, we are looking for a new hobby to do together. 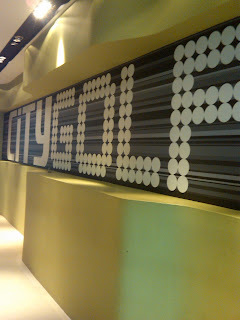 As we did took golf lesson a few years ago but both didn't really play except for a few 9-holes and Par-3 courses, we decided we will start golf together. I am not going to join any boys only cliques, which usually have 'trips' to certain part of Asia and will stick to playing privately with my wife. 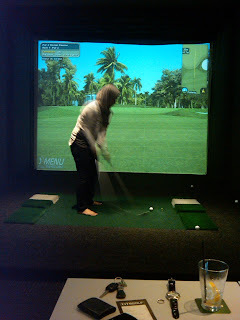 We already did a few sessions at the driving range including one in an indoor golf simulation place in Bangsar Shopping Center. The pictures of her taking a swing or readying to take a swing was from my Blackberry camera but me taking as if that good swing is from a friend's camera. 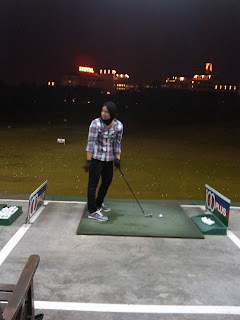 Golf sounds like a good hobby to do together. 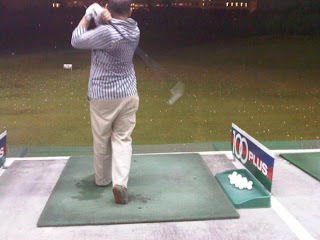 I don't play because I'm left-handed and I think it would probably be difficult to find golf clubs for me.